NAPLES, FLORIDA, UNITED STATES OF AMERICA, May 9, 2018 /EINPresswire.com/ -- SubscriberWise, the nation’s largest issuing CRA for the communications industry and the leading protector of children victimized by identity fraud, announced today information concerning independent 3rd-party evidence to strongly support allegations of a civil theft cover-up while also exposing categorical false information and inconsistencies reported under-oath and part of a brazen financial scheme at the Enterprise Holdings’ National Car Rental agency located inside the SW FL Fort Myers International Airport. 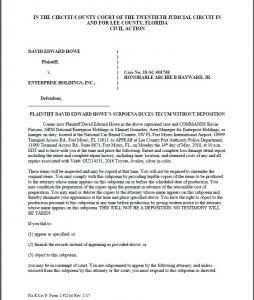 The same Enterprise Holdings’ National Car Rental airport location was publicly exposed for its attempt to charge a SW FL couple for under-carriage damage: http://www.winknews.com/2016/02/29/sanibel-couple-charged-for-under-car-damages-to-rental/ . Once the news became public, the company quickly dropped the money demand and retorted to the usual mantra of ‘Human Error’. “I spoke to the Florida State Attorney Russell’s office on Monday,” confirmed David Howe, National Car Rental victim. “The individual I spoke with explained that I would need to start with an investigator before I would have any possibility to meet with the State Attorney. I immediately agreed and told the representative that I’m looking forward to the meeting, and most importantly, to providing overwhelming evidence of a civil theft cover-up, as well as what I intend to argue to the Lee Court is, from my perspective, also a criminal cover-up. “And based on information contained in the official Lee Port Authority Police file, I am very confident the Court will agree with the FACTS and the EVIDENCE that are indeed devastating and overwhelming to any attempt by Tortfeasor to cover-up the intent and facts of that day. “Regardless, however, of whether I am able to convince the Court of a possible CRIMINAL cover-up, the evidence and claims of so-called ‘Human Error’ -- AND THE OBVIOUS CONNECTION TO THE CIVIL THEFT CASE AND COVER-UP -- will truly be beyond belief for any reasonable person who hears and sees the evidence,” Howe insisted. 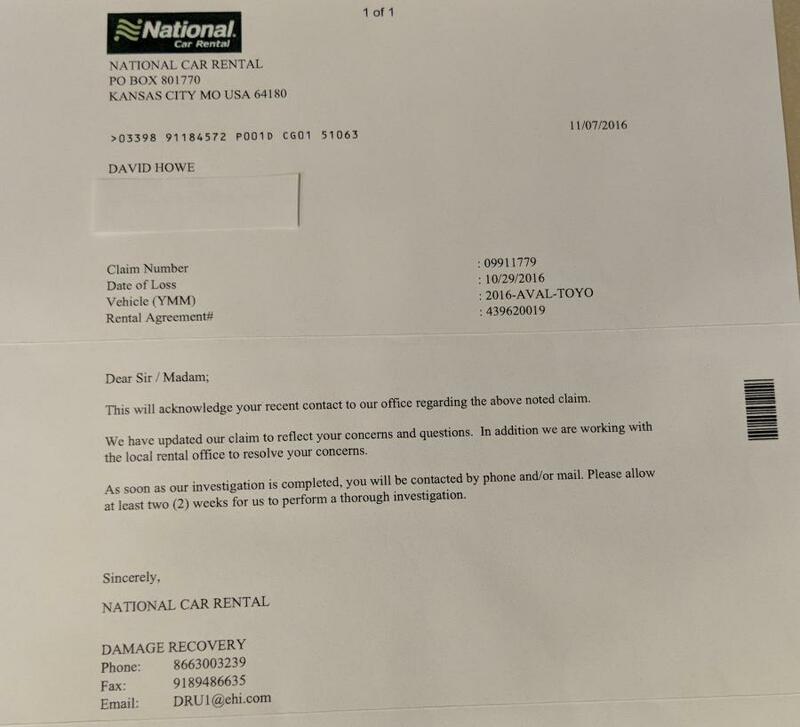 “For the record, the police file has a photograph of SUBSEQUENT/NEW damage that was -- ABSOLUTELY -- not on the vehicle at rental return check-in. Yes, I have remarkable and unimpeachable evidence to prove this,” emphasized Howe. “And in the police report, you can see the shadow of a person with a camera right above the 'mysterious' damage taking a photo. That photo was then inserted into a PDF and emailed to me as part of the $502.80 money demand. “I want to know the exact date and time of that photo. I want to know who took the photo and where it was taken. “Frankly, it’s sincerely and genuinely difficult for a victim to see such a dramatic abuse of the good faith and fair dealing covenant. And it only adds to my outrage and anger when it’s all passed as mere ‘human error' through this monumental and obvious COVER-UP,” declared victim Howe. “I’m just thankful that the police report so profoundly documents my FACTUAL case from predatory start to predatory finish. Kudos to Lee Port Authority Police for its unbiased and thorough investigation -- including, and most critical, the witness statements that so dramatically substantiate Enterprise Holdings’ National Car Rental corporate failure and civil tort beyond all belief. And, for the record, my conclusion that the detective(s) did an excellent investigation holds true despite the fact that the investigator did not uncover the criminal behavior that I continue to perceive. “Without question, this entire case smacks of a cover-up. The veiled and desperate attempt at ‘mistakes’ and ‘human error’ will be decisively impeached – exposed for what it is and for its span of nearly 5 weeks of predatory behavior, no doubt about it. “To be certain, the myriad and mountain of FACTS definitely support the argument of intent – not human error or stunning incompetence that’s detailed repeatedly in the police report,” Howe added. “Yes, after an otherwise ordinary evening dinner and a typically casual conversation, I learned about the existence of additional independent evidence that would substantiate many of the details that I’ve provided Lee Port Authority police, as well as further impeach the categorical lies and false statements proffered under-oath to conceal the theft. “In the meantime, I urge Florida regulators -- as well as journalists and investigators in and out of the state of Florida -- to obtain the entire Lee Port Authority Police Report – INCIDENT NUMBER: 2016000055203 – for a complete view of comprehensive evidence with unconverted false information and stunning proof of a cover-up that spans nearly 5 weeks – until the very moment Lee Port Authority police and Wink News, with cameras rolling at the crime scene, launched their investigations.” concluded Howe.